段然, 杨春宇, 苏加福. 园林照明对窄叶石楠光合指标的影响[J]. 同济大学学报(自然科学版), 2018, 46(7): 951-955. DOI: 10.11908/j.issn.0253-374x.2018.07.013. Abstract: To clarify the impacts of artificial light spectrum and illumination intensity on the photosynthetic indices of landscaping plants, spectral irradiation experiments were conducted on Photinia serrulata at three light intensities with five different light emitting diode(LED) light emitting cliode. Analysis of the relationship of artificial light spectrum, light intensity, the net photosynthetic rate and photosynthetic active radiation. Results showed that: At the same light intensity, photosynthetically active radiation of plant was the highest under sunlight, which was far higher than that under the LED light sources. Under LED lights, net photosynthetic rate of Photinia serrulata rose with enhancing light intensity. Under green LED light (530 nm), photosynthetically active radiation of plant increased with enhancing light intensity. However, net photosynthetic rate remained negative all along. 其中：Qpar为光合有效辐射量子能量，能够反映出植物在进行光合作用时量子参与的特性；h为普朗克常数，6.625 5×10-34J·s；c为真空光速，2.997 8×108m·s-1；Av为Avogadro常数，取值6.02×1023mol-1；λ为光谱能量波长，nm; λ0为400 nm，λ1为700 nm.根据公式，在相同光谱下，可进行人眼视看光照强度与光量子间的转化. 实验地点位于重庆市西部，年平均温度18.4℃，年降雨量1 125.3 mm，年平均日照时数888.5~1 539 h(重庆市气候中心2017年报告).为了控制环境因素对研究对象的干扰，实验开展于重庆大学实验田，并检测控制实验田物理环境因素，确保人工光照为影响实验的单一变量. 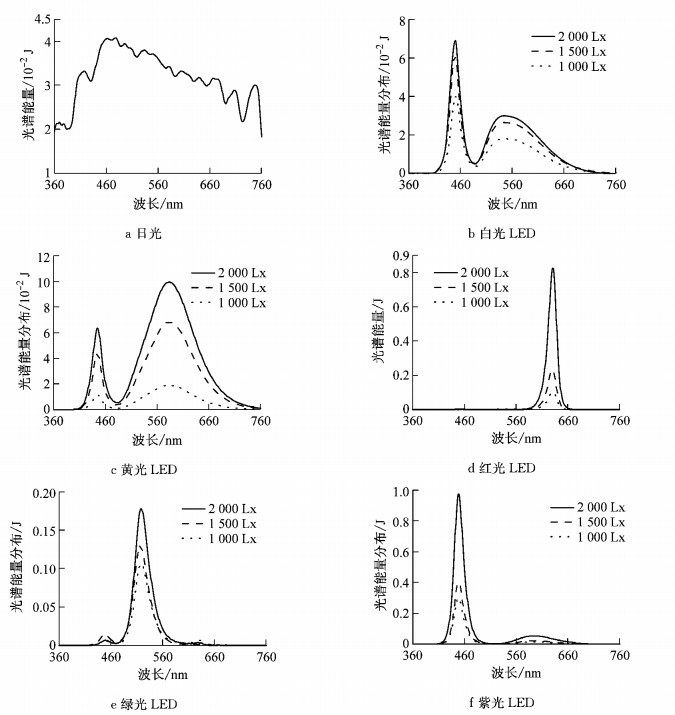 5种LED光源光谱分别为白光LED，黄光LED，紫光LED(主波长425nm)，绿光LED(主波长530 nm)，红光LED(主波长620 nm).每种光谱设置的光照强度为1 000、1 500、2 000 Lx，并设1组参照组仅受天然光照射不进行人工光照射，即，共16组实验，每组照射3株植物，所有植物均生长于标准的花园土壤.按市政园林植物照明时间对植物进行照明，时间为6:30 pm~10:00 pm.照明时利用遮光板遮挡于植物之间，使植物仅受实验光源照射，避免光源相互干扰(图 1)，日间拆除挡板. 利用分光辐射照度计CL-500A(波长范围360~780 nm)对实验LED光源光谱能量进行测量(图 2).通过对比，得出随着光照强度增大，LED光源光谱能量峰值不断升高，甚至高于相同光照强度下相同波段天然光光谱能量；白光LED与黄光LED，波峰在460 nm附近，蓝光成分富含较多，且同时富含较高强度的红光(510~710 nm)成分.红光LED、绿光LED、紫光LED光谱能量分布范围较窄，与天然光光谱差距极大，波峰分别在620、530及425 nm处达到最高值. 利用照度计测量天空照度，同时利用Li-6400便携式光合仪测量天然光光谱下窄叶石楠PN和PAR.导出实验数据，在光照强度为1 000，1 500及2 000Lx时，窄叶石楠的PN分别为0.32、1.07 l，4.67 μmol·m-2·s-1；窄叶石楠的PAR为3、13、24 μmol·m-2·s-1.对数据进行统计，当光照强度高于900 Lx时，窄叶石楠PN由负转正；在2 000 Lx内窄叶石楠PN随光照强度的增强而增加(图 3). 分别测量1 000、1 500及2 000Lx光照强度，5种人工光源光谱照射的植物PN与PAR(表 1~表 3)，得出相同光照强度不同光谱能量分布与窄叶石楠光合指标PN、PAR的关系. Plant Factory Laboratory. Light source for plant cultivation. [EB/OL]. [2012-03-20]. http://www.sasrc.jp/kougen.html.2012.